The following are 10 simple noise control techniques that have wide applications across the whole of industry. In many cases, they will produce substantial noise reductions quickly and cheaply – with little or no effect on normal operation or use. Normally required on steel sheeting that will ‘ring’ when struck with a hard solid object. This is because the sheeting vibrates and resonates generating and adding to any existing noise already in evidence. This is more usually a problem with steel guards surrounding machinery and if left untreated, can considerably add to any existing noise problems. Chutes, hoppers, machine guards, panels, conveyors, tanks . 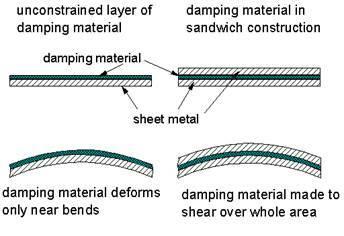 . . . .
— unconstrained layer damping where a layer of bitumastic (or similar) high damping material is stuck to the surface. For this we can offer our SBM5 Sound Barrier Mat that will add mass and stiffen the panel thus reducing the vibration that causes resonance. Constrained layer damping is more rugged and generally more effective. Either remanufactured steel (or aluminium) guards, panels or other components from commercially available sound deadened steel or buy self adhesive steel sheet. The latter can simply be stuck on to existing components (inside or outside) covering about 80% of the flat surface area to give a 5 – 25dB reduction in the noise radiated (use a thickness that is 40% to 100% of the thickness of the panel to be treated). Alternatively, use Sta-Stuk aerosol contact adhesive to glue two layers of steel together but it is important to ensure that any steel to be treated is clean and degreased beforehand. becomes increasingly difficult to achieve a substantial noise reduction. Fan noise is a common problem and can vary from small fans used to ventilate areas to much larger air movement fans often used for cooling equipment such as air conditioning plants. This article will deal with fans that rely on ducting that is more easily soundproofed. 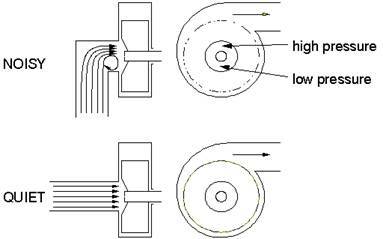 Axial flow or centrifugal fans. Maximum fan efficiency coincides precisely with minimum noise. Any fan installation feature that tends to reduce fan efficiency is therefore likely to increase noise. Two of the most common examples are bends close to the fan (intake side in particular) and dampers (close to the fan intake or exhaust). Ideally, for maximum fan efficiency and minimum noise, make sure there is at least 2 – 3 duct diameters of straight duct between any feature that may disturb the flow and the fan itself. Noise reductions of 3 – 12dB are often then possible. 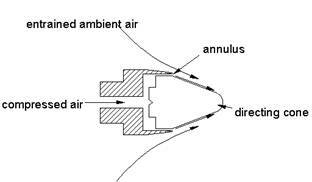 Where sound insulated ducting is used to reduce noise from any fan, it should be as long as possible and incorporating a right angle bend at least half way from the fan. The inside of the duct can be lined with sound absorbing foam such as non-flammable FR type self-adhesive acoustic foams. Alternatively, the outside of the duct can be lagged with a single or several layers of SAPT220 Sound Barrier Mat. A lot of noise can break out through the walls of any uninsulated ducting as well as from any vents they may serve. Large air conditioning ducts are the main culprit and due to their thin steel walls can resonate and transmit noise along its length. Extraction, ventilation, cooling, openings in walls and enclosures. Instead of fitting silencers, it is often possible to achieve a 10 – 20dB reduction in airborne noise from a duct or opening by lining the last bend in the ductwork with non-flammable FR type acoustic absorbent foam. Alternatively, construct a simple absorbent lined right-angled bend to fit on the opening. Ideally, either side of the bend should be lined along a length equivalent to twice the duct diameter. Where flow velocities are high (> 3m/s), consider using a film faced acoustic foam. Duct vibration can usually be treated by damping (as above). To stop noise being transmitted along the steel sections of ducting, acoustic resilient duct connectors can be fitted instead of the usual rigid fixing method. Axial or centrifugal flow fans. Fan noise is roughly proportional to the 5th power of fan speed. So in many cases it is possible to achieve a large noise reduction from a small drop in fan speed by changing control systems or pulley sizes and re-setting dampers. The following table provides a guide to the trade-off that can be expected. Note : A well designed silencer will not increase system back pressure. multiple exhausts : manifold them into a single, larger diameter pipe fitted with the rear silencerfrom virtually any make of car (from your local tyre and exhaust fitter). Typically 25dB reduction. Cooling, drying, blowing . . . . . In most cases, it is possible to replace existing nozzles (usually simple copper pipe outlets) for quiet, high efficiency units. These not only reduce noise levels by up to 10dB, but also use less compressed air. The types of nozzle to look out for are entraining units (schematic below) from various manufacturers and in a variety of sizes. Machine feet, pumps and mezzanine installations . . . . . Mounting motors, pumps, gearboxes and other items of plant on rubber bonded cork or rubber Anti-vibration pads can be a very effective way of reducing transmission of vibration and therefore noise radiated by the rest of the structure. This is particularly the case where vibrating units are bolted to steel supports or floors. However, a common error with the use of these pads is for the bolt to ”short-circuit” the pad, resulting in no isolation. 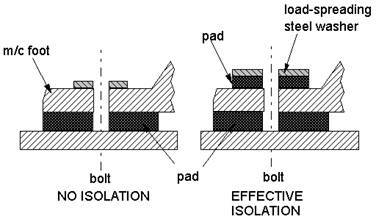 Additional resilient pads must be fitted under the bolt heads as shown below to stop any fixing bolts from bridging any other form of isolation. There are many types of off-the-shelf anti-vibration mounts available, for instance rubber/neoprene or spring types as well as M20. The type of isolator that is most appropriate will depend on, among other factors, the mass of the plant and the frequency of vibration to be isolated. Any supplier of anti-vibration mounts will be able to advise you on this. Reducing by half the “gap” open area in a set of guards can reduce the noise by 3dB. If you can reduce the openings (flexible seals, additional close fitting panels etc) by 90%, then a 10dB noise reduction is possible. Lining a significant proportion of the inside of the guards with sound absorbing foam will reduce the noise “trapped” by the guards. Consequently, less noise will escape through any gaps. Failure to line the inside of the guards could result in an increase in noise at the operator’s position if the gaps have been minimised as in (i) above. It is important that any guards or screening of machinery is tight and does not rattle because if left untreated can substantially add to the levels of noise pollution an operator and nearby personnel can be subjected to. Large thin panels may also resonate (vibrate) and this will also contribute to noise pollution. Panels such as this can be stiffened as described in the first chapter at the start of this document. In the first two cases, both sets of modifications can be tested in mock-up form using cardboard (and wide tape) to extend the guarding and temporarily fitting areas of acoustic foam inside. Not only does this process help with the practical aspects (access, visibility etc), but it usually also provides a very good indication of the noise reduction that can be expected. Very “Blue Peter” but very effective. Guard vibration radiated as noise can also be treated via damping (as detailed at the beginning). Noisy chain drives can often be replaced directly with quieter timing belts. Within the range of timing belts available, there are also quiet designs that use different tooth profiles to minimise noise. There is also a very new design of belt for applications where noise is critical which uses a chevron tooth pattern to provide very quiet running. Noise reductions in the range of 6 – 20dB are often possible using this approach. Most companies have large numbers of electric motors used on anything from fans to pumps to machine tools. However, it is not very common knowledge that general duty motors are available (at little or no cost premium) that are up to 10dB(A) or more quieter than typical units as direct replacements. The best approach is to feed these motors into the system over a period of time so that all replacement motors are quiet motors. Much of the information contained on this page was obtained from http://www.hse.gov.uk/noise/). And originated from the Engineering Industry Noise Task Group.